Your support will help to better serve all of our children. My name is Sarah Kooluris, and my son AJ attends kindergarten at Devereux NY CARES (Center for Autism Research and Educational Services). He is close to completing his first year, and I can honestly say that the school has been the best thing that has ever happened to AJ and our family. We never expected to find ourselves at Devereux, having planned for a different path. Sometimes, though, things work out for a reason. I hope that you will be inspired by our story and help to support our fantastic school. 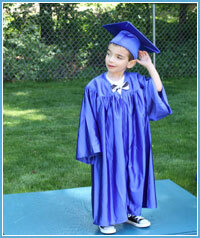 AJ was diagnosed at 22 months and attended a special preschool. We hoped AJ could attend a “regular” school and moved our family to achieve this goal. It took weeks, even months of research, SEPTA meetings, parent and faculty decisions but we thought we finally had it all figured out. After moving to a new town in July 2014, we had our very first CSE meeting. Excited, anxious and nervous, nothing could have prepared us for the news we would receive. The district changed their special needs classes and did not have an appropriate program for AJ. We were devastated – after months of planning, we were back to the beginning. The district sent out referrals to several private schools and nothing felt right - until we walked into Devereux. Happy with the school, we were still hopeful this would only be temporary, and AJ would soon begin school in district. Then we witnessed AJ’s progress. For the first time in my son’s life, he began, and still is, running to the school bus every morning. It was amazing. AJ started smiling on a daily basis when we talked about school. Progress reports started coming home indicating growth and positive progress at school. I have always been proud of my son and the accomplishments he has made in his life, but this was something I’ve never experienced before. We have even seen AJ’s classroom progress transition into our home. We no longer plan to change AJ’s school and look forward to a long relationship with Devereux NY CARES. We are excited, and maybe a tiny bit anxious, about the move to the new building in Mt. Kisco which I believe will be wonderful for our children. As parents and friends, we can help to make the new school even better. While the cost of the physical move and new lease are paid for, there is a shortfall between public funding and the cost of making the school as good as it can be. Devereux NY CARES strives to provide our children with the very best services, space and individualized attention possible. Currently, they would like to upgrade recreational activities for our children to coincide with the move to Mt. Kisco, but that cannot be accomplished without private support.